Madame Marie Cruie was a French physicist and chemist famous for her work on radioactivity. She was a pioneer in the field of radioactivity and the first person honored with two Nobel Prizes, first in physics and second in chemistry. She was also the first female professor at the University of Paris. Maria Skłodowska was born on November 7, 1867, in Warsaw, Poland. Her father belonged to a farmer family, but studied at the Warsaw High School and took up teaching mathematics and physics there. Her mother was a good pianist. When Marie was 10 years old, she lost her mother due to tuberculosis. At that time, the Russian Czar ruled Poland. Marie’s father was forced to leave school for his revolutionary speeches and took up the cause for freedom struggle. He started a boarding house for students, but it did not do well. He could hardly manage a square meal for his family. Marie’s elder siblings Bronia and Joseph won gold medals at high school. Joseph was admitted at university to study medicine. Poland did not have any provision for higher education for girls, so her father asked Bronia to take tuitions in Warsaw, save some money and then go to Paris for further medical education. Since childhood, Marie had a very good memory and at 17, won the gold medal on completion of her education from the school at the Russian lycee. As her father, a teacher of mathematics and physics, lost his savings through bad investment, she had to take work as teacher and at the same time, took part clandestinely in the nationalist ‘free university’ reading in Polish to women workers. To improve her failing health, her father sent her to spend some time in the rural area. On her return after a year, her father found her a healthy and beautiful girl. Seeing the family’s weak financial condition, both sisters decided to help their father. One would work and the other would continue study. Bronia left for Paris to study medicine and Marie started earning. After struggling to get some decent work, she was engaged as a governess. Gradually, she became part of that family. When the eldest son of the family studying at Warsaw University returned, he immediately took a liking for Marie. Both were attracted towards each other. But his mother did not approve of this relationship between her son and a maid. Heartbroken, Marie left the job. She even thought of committing suicide, but nature had something else in store for her. She soon got another job. Meanwhile, Bronia completed her studies and married a classmate. Sometime later, her sister asked Marie to join them in Paris. In Paris, the 23 year old Marie resumed study in science at Sorbonne University. She worked very hard for four years. She rented a small room on the upper floor of a house in a poor locality and concentrated fully on her education. She lived a life with limited means. Winters were particularly difficult, for she had a few warm clothes. Meat, wine or eggs were luxuries she could ill-afford. She used to earn by doing odd jobs. She appeared for her post-graduation examination in physics in 1894 and stood first. Next year, she again appeared for mathematics and stood second. She had finally realized her dream. Keeping her father’s word Marie had excelled at studies and returned home. An aging father and poor family conditions made her realize that she had to cut short her studies in Paris and stay at home. But destiny willed otherwise. In Warsaw, she met a rich lady from an aristocratic family. After hearing Marie’s story, she arranged for her scholarship. Encouraged by future prospects, Marie immersed herself in further study. With her father’s blessings she set off to Paris. Improvement in her family’s financial situation, coupled with her good results, spurred her to concentrate on her studies. Once, a Polish scientist Prof Kowalski came on a discussion. Here, she met another talented young man – his wish to see her again. After courting for a year, they got married. 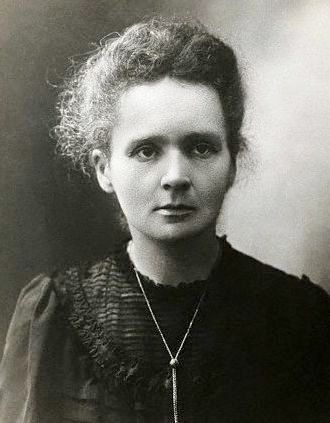 Marie Sklodowska became Madame Marie Curie. Pierre was a scholar and a wonderful human being. He had graduated with physics at the age of 16 and acquired a post degree at 18. Besides, he had also researched on piezo electric effect. His father was a well-Known doctor. 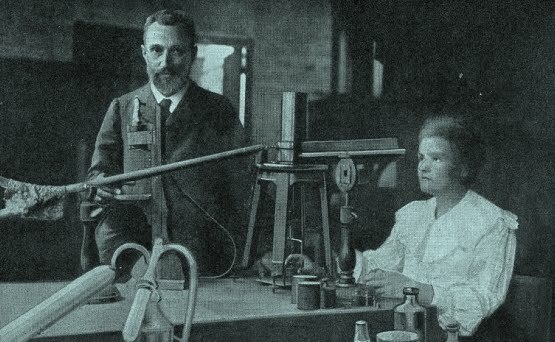 After marriage, Marie and Pierre Curie started working together. Meanwhile, German scientist Wilhelm Roentgen had discovered X-rays, a short wavelength radiation having immense capacity to penetrate through solid objects and across the world of science. At the same time, Henri Becquerel was carrying out research on fluorescence. After several experiments, he had come to the conclusion that there was some other element besides uranium in the raw metal pitchblende. Impressed by Marie Curie’s talent, he came to meet Marie to seek answers to some problems he had been facing. Marie and Pierre Curie took up the challenge willingly. In 1896, Becquerel discovered that some unknown rays constantly emanated from pitchblende. These rays were initially called Becquerel rays. Later, Madame Curie worked on it extensively and named this radiation type of activity as radioactivity, and the rays were called radioactive rays. In 1897, Marie gave birth to a healthy baby girl. She was named Irene. Some time later, Pierre’s mother passed away. His doctor father moved in to live with the Curie family. Marie had left her daughter, Irene, under the care of a maidservant. Having a father-in-law around with a baby girl, under the care of the maidservant, they could work hard in the laboratory. Later Irene followed the footsteps of her illustrious parents and earned fame. Along with her scientist husband Juliot, she won the Nobel Prize for Chemistry in 1935. The Curie couple was sure that in pitchblende besides uranium, there was some strong radioactive element present. To separate this element from uranium was a challenge. Pitchblende was a very expensive ore and was not easily available. They came to know that Austria possessed pitchblende in abundance. They requested the Austrian government to release some pitchblende after separating uranium from it, for their research. The government agreed to provide the ore free, but the transportation was to be borne by the Curies. Finally, tons of pitchblende arrived in ships and were unloaded in a wooden shed in the Curies’ laboratory. They placed the pitchblende in a huge iron pan and allowed it boil. Thus, an unused shed became their laboratory. Two years of perseverance resulted in the separation of a small quantity of a compound of bismuth which was 300 times more powerful in radioactivity than uranium. In July 1898, they announced the discovery of a new element, which was named polonium after Poland, Marie’s motherland. All this time, they were aware that their search for the most powerful radioactive elements and at the end of crystallization process they noticed some crystals of the new element radium. In 1903, the Curie couple shared the Nobel Prize for Physics with Henri Becquerel. The Curie couple had then become world famous. In 1904, Marie gave birth to their second daughter Eve. Life was looking up and things were moving smoothly. Tough days and despair had gone and the family was now comfortably settled. 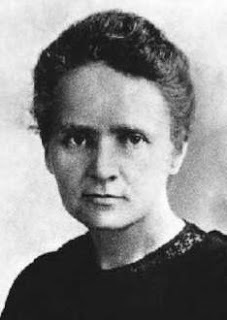 On April 19, 1906, Pieree Curie, while returning home after attending a meeting, was run over by a farm cart in the rue Dauphine in Paris and died instantly. Marie’s world suddenly turned dark. But this spirited woman took up the responsibilities to fulfill Pierre’s dream. As a special case, the French Department of Education appointed Marie as a professor in place of Pierre and honoured her. No woman was ever given such a high position by the university. Many turned jealous about this. She continued taking care of her family, while continuing her research and taught at the university simultaneously. She efficiently discharged all the responsibilities that she shouldered. In 1910, she succeeded in isolating pure radium. In 1911, she was once again honoured with the Nobel Prize. It was for Chemistry this time. Madame Curie was the first person to receive this honour twice and that too in two different branches of science. In July, 1914, Madame Curie fulfilled the dream of her late husband to establish a huge laboratory in Paris in his fond memory. Meanwhile, World War I had begun, so it could not become operational. Moreover, her colleagues were engaged in war duty. Soon after the war ended, the laboratory started functioning. On July 4, 1934, this spirited lady and first woman scientist to receive the Nobel Prize breathed her last near Sallanches, France.